Sunnyvale, Calif. – January 13, 2010 – Vitria Technology, Inc., today announced a partnership with Nexperient to provide solutions for operations groups at investment managers and custodian banks to integrate off-line processes and core applications in a single environment, potentially saving organizations tens of millions of dollars by increasing capacity, reducing risk and improving service levels. Leveraging Vitria’s M3O Operational Intelligence platform and the operations management expertise of Nexperient founders Paul Bradley and Jack Singleton, the partnership will create tailored solutions helping investment managers and custodian banks grow their business, reduce run-rate expenses, and provide process transparency for managers. Prior to founding Nexperient, Bradley was associate partner and vice president at Wellington Management Company, LLP, and Singleton was senior vice president at State Street Corporation. “Using M3O’s Operational Intelligence dashboards, we can provide operations managers with a forward-looking view of event data to more effectively manage production from core applications and off-line processes,” said Bradley. Vitria’s M3O Operational Intelligence suite goes beyond traditional analytic solutions to identify and detect situations that can adversely impact business processes. Nexperient’s implementation of M3O empowers managers to analyze and correct inefficiencies in real time, cutting costs and reducing risk. According to Singleton, business demands and regulatory requirements typically outpace the ability to update core applications so “temporary” manual workarounds are created, often becoming part of the permanent workflow. Nexperient exploits M3O’s capabilities to create model-driven workflow automation, exception handling, and event monitoring. M3O combines and relates Web 2.0, BPM, and event management in one application, empowering business analysts, managers and IT to respond to market demands in real-time and enabling companies to increase business responsiveness and agility. Learn more about creating capacity in Financial Services. Based in Boston, Nexperient is focused on the needs of financial services companies, primarily in the Operations arena. We help clients introduce and implement BPM and Operational Intelligence as strategic solutions, leveraging their current staff and infrastructure investments..
Vitria Technology, Inc. provides the industry’s leading Operational Intelligence platform, empowering partners and customers to develop innovative Operational Intelligence solutions to analyze business activities in-process and take realtime action. The result is better decisions when they matter most—before opportunities have faded or problems have escalated. 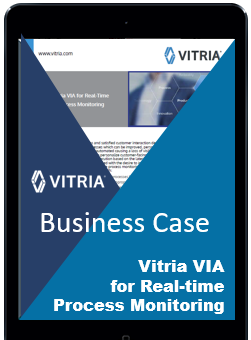 With a rich heritage as a technology pioneer, Vitria’s award-winning process integration solutions provide the backbone for many Global 2000 companies’ mission-critical business processes. Vitria has customers in North America, South America, Europe, Asia, and Australia.